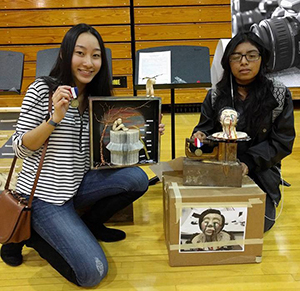 Texarkana, TX – Maryanne Garcia and Triann Nguyn, art students at Texas High School, received Superior Ratings during the Region VIII Visual Arts Scholastic Event (VASE). With over 428 student artists registered, the event was held on February 25 at Pleasant Grove High School. Garcia and Nguyn will now move forward to the state competition in San Antonio, TX in April. Sponsored by the Texas Art Education Association, VASE provides the opportunity for students to bring artworks created in their art classes to a regional event where they are interviewed by a certified juror who evaluates their work based on a standards-based rubric and their understanding of the art processes involved in the development of their artwork. The jurors look for originality of concept, technical expertise and the interpretation of the student’s stated intent. Garcia’s artwork, “Heads,” showcased a wooden box with a balance on top and a ceramic head on top of the balance. Nguyn’s creation was titled “Mountains.” The artwork was contained within a wooden box and featured folded book pages, copper wire manipulated into a tree with branches and ceramic figures on the book and on the outside of the box. Symbolism of the piece focuses on her process of growing up and leaving her family behind but the foundation of the tree still holding her in place and supporting her.